Needless to say, I hastened back to Saint Irini, an isolated, dove-white chapel reached by a dramatic coastal footpath. It is, indeed, a very beautiful place. I would like to take you there. I have lived since 1982 in a village in the Peloponnese. In 1995, I began taking groups of up to 8 individuals to Greece. As a participant in Excursions & Sojourns in Greece, you create or enrich friendships within your small group and with native Greeks. You appreciate accommodations, restaurants, and sites unknown to most tourists and inaccessible to larger groups. You enjoy a balance between ancient and modern, between the renowned and the undiscovered, between structure and spontaneity, between activity and serenity, between society and solitude. You acquaint yourself with a place, a people, and their history through literature, through stories I tell, and through your own direct experience. A sign posted at the gate to the chapel of Saint Irini reads, For worship, not for tourism. Your stay in Greece will inspire appreciation, reverence, and sometimes awe. Because owner/operator/driver Thordis Simonsen has lived in Greece since 1982, Excursions & Sojourns in Greece offers you an intimate and unique experience that combines the best of independent and small group travel. Enjoy both the camaraderie and the independence made possible by travel with up to 8 like-spirited individuals. Visit renowned sites as well as unwritten places made known to Thordis by her Greek friends. Communicate with your Greek hosts directly or through Thordis, who speaks Greek fluently. Lodge in modernized traditional guesthouses and pensions that extend the hospitality for which Greece is famous. Choose from a range of Greek specialties served at colorful local taverns. Ask Thordis, your driver, to stop anywhere, anytime, for photographs, extended views of dramatic scenery, and interactions with people. Enjoy the breadth provided with travel by car or van and the depth achieved by hiking and/or walking. Take advantage of unscheduled time to improvise: write, photograph, draw, contemplate, or socialize. Crete includes Knossos, the Archeological Museum of Heraklion, old town Hania, hiking spectacular coastal trails and gorges, and ample unscheduled time for personal pursuits and/or reflection. Stand under the tree where Zeus, disguised as a white bull, laid the princess, Europa. Explore the labyrinth of Knossos where Theseus slew the legendary Minotaur. Gaze at the enormous stone bear in a cave where the goddess, Artemis, was worshipped. Hike a pristine canyon to a Doric temple of healing and Roman vaulted tombs. Frolic in shimmering coastal waters stilled by Poseidon, Lord of the Seas. Admire priceless textiles woven today on a 400-year-old loom. Dine in a building of Venetian origin that was converted to a Turkish bath. Sojourn on the shore of the Libyan Sea at an idyllic resort you reached by foot. Numerous moderate to more difficult hikes/walks on narrow, often rocky and steep paths and old stone-paved trails and stairs through spectacular gorges and along coastal sections of the European Mountaineering Footpath (E-4 ) ranging from 3 to 7 hours duration including pauses to picnic, sit, explore, and/or swim; hiking boots required; walking sticks recommended. The standard Crete excursion should not be attempted by individuals with acrophobia or vertigo. Making all passages by ferry, the Cycladic Islands excursion includes Tinos, ancient Delos, a night on Mykonos, and a week on Naxos. Admire more of Tinos’ elaborately decorated dovecotes than you can keep track of. Imagine crawling an uphill road to a church housing an ikon widely known for its healing powers. Confront Delos' famous lions, carved in the 7th century from Naxian marble, and then view the marble quarries themselves. Lodge for 7 consecutive nights in a secluded guesthouse sitting below Naxos’ high-walled Venetian kastro. Explore a 6th century BC Temple of Demeter built entirely of marble, including its translucent roof tiles. Circle a 26-foot 6th century BC marble kouros sculpture abandoned in the quarry where it was carved. Walk a stone-paved track along a valley to a 9th century iconoclastic church. Climb several hundred feet to the top of Mt Zas—at 3,300 feet, the highest peak in the Cycladic Islands. Sample an array of local specialties including Kitron, a liqueur still produced in the original family-owned century-old copper still. Several moderate walks on old stone-paved tracks ranging from 1 to 4 hours duration including time to rest and picnic; one or two more difficult optional hikes to summits approximately 3 hours duration including time to rest and snack; hiking boots required; walking sticks recommended. Swimming is optional. The standard Cycladic Island itinerary can be modified to include more or fewer walks/hikes. Epiros & Thessaly includes ancient Dodona and Delphi, the monasteries of Meteora, the museums of Ioannina, the traditional villages of the Zagoria, Vikos Gorge, easy walks, and ample unscheduled time for personal pursuits and/or reflection. Stand in the center of the Sanctuary of Athena at Delphi founded, according to legend, by Zeus. Savor the taste of cheese pies served by a village cafe specializing in this fare for over 40 years. Walk across the graceful, near-perfect, arched stone packhorse bridges for which the Zagoria is famous. Sit in the 3rd century BC theater at Dodona, one of the largest and best preserved in Greece. Follow a trail to the rim of Vikos Gorge, one of the most magnificent natural wonders of Greece. View 19th & 20th century fine paintings by Greek artists collected by a beneficent citizen of Metsovo. Ascend stairs to a 14th century monastery crowning a rock pinnacle at Meteora. Overnight in a traditional guesthouse located within a 13th century walled fortress. Easy walks at archeological sites and on riverside and plateau paths and old stone-paved tracks; climbing steps to monasteries; optional 1-hour climb up steep old stone-paved mule track; 1 to 4 hours duration including pauses to picnic, sit, and/or explore; hiking boots required; walking sticks recommended. 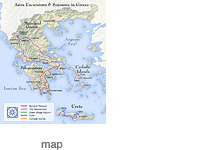 The standard Epiros & Thessaly itinerary can be modified to include moderate to difficult hiking. The Peloponnese includes the ancient sites of Mycenae and Epidavros; the Byzantine centers of Monemvasia, Mystras, and the Mani; the Peloponnesian Folk Art Museum; author/guide's reverently restored house, moderate walks, and ample unscheduled time for personal pursuits and/or reflection. Discover an orchid hidden in a maze of wild flowers in May; plunge into the Lakonian Gulf in June; grab a tree-ripened fig in September. See the double-eagle marble plaque marking the spot on the floor where the last Byzantine emperor was crowned. Ride in a private motorboat to the partly submerged mouth of the Cave of Hades. Follow a paved mule track up to a high mountain village offering a bird's eye view of the Mediterranean. Walk across a filament of land to the inconspicuous ruins of a 13th century fortress where a princess, under attack, mounted a white horse and dove to safety in the sea. Visit an unschooled weaver who improvises on traditional designs. Overnight in a Byzantine style hotel in a fortified medieval town: the Mont-Saint-Michel of Greece. Several easy to moderate, primarily coastal walks on narrow, rocky, often hilly footpaths and old stone-paved tracks, 3-6 hours duration including pauses to picnic, sit, and/or explore or swim; hiking boots required; walking sticks recommended. A healthy woman celebrating her 70th birthday walked the most challenging route comfortably. Astra Writing in Greece is based in a coastal village in the Peloponnese where host Thordis Niela Simonsen has sojourned annually since 1981. When she takes you to Elika, she takes you home. You will reside in a small family-owned coastal hotel, but you will write under the roof of the house Thordis restored by hand. For decades, Thordis has yielded without relent to her creative impulses. When she facilitates the daily writing practice, she draws on her experience as a visual artist as well as a writer. Thordis is particularly adept at shaping the writing sessions according to the setting and the moment. As one participant in Astra Writing in Greece volunteered, "Wherever she’s going, just follow her and you’ll be fine.” Working in a supportive, nonjudgmental environment that welcomes spontaneity, you are likely to find your authentic voice. Meet the villagers Thordis writes about in her book Dancing Girl. Take inspiration from Homer and Kazantzakis. Write on the terrace of a seaside chapel reached by a 90-minute walk along a rugged coastal trail. Discover the foundation of a lone chapel marking the site of a remote village destroyed by the Turks. Relax on a pristine beach and then enjoy Greek fare at a picturesque island fishing village. Toast your writing success with a glass of Malvasi wine. Extensive, easy walking in and around a hillside village and by the sea. Thordis is also available to design custom itineraries for independent travelers. The small size of your group makes it possible to stay in modernized traditional guest houses and pensions too small to accommodate larger groups. Each establishment is chosen for its historic interest, decor, and/or setting. Two- and 3-night sojourns allow you to know your hosts and the surroundings intimately. Settle into a converted 19th century school in a mountain village where one cafe is the only commercial establishment. Lodge in an impressively updated Venetian town home that housed the French embassy before it became the residence of a great Greek politician. Rest in an attractive modern pension with private balconies overlooking a glittering sea. Observe from the windows of your decades-old plaza hotel the comings and goings of women in traditional dress. Sojourn in a restored tower house in the heart of an unforgiving landscape where the vendetta was a way of life. View from the terrace of your high mountain pension the world seen by Zeus. Delicious cuisine is reason enough to travel in Greece  and to return. During your travels with Excursions & Sojourns in Greece, you enjoy at least one restaurant meal a day at an establishment distinguished by its exceptional fare, decor, and/or setting. Whether you are ordering from a menu or from cooking pots in the kitchen, Thordis can interpret for you. You often picnic midday; produce stands, bakeries, and markets are available for provisions. Vegetarians are easily accommodated. Enjoy a meal prepared especially for the "American Girl" and her guests. Select a fresh fish from the refrigerator at a colorful seaside tavern. Enjoy a picnic on the upper row of seats at a 4th century theater. Lunch at a viewing platform on the rim of a spectacular gorge. Snack at a Venetian stone quarry on the shore of the Mediterranean. Sip bottled wine made exclusively from the vineyard at a 14th century monastery. Excursions & Sojourns in Greece combines driving with walking to provide breadth with depth. Whether traveling by road or on foot, we proceed always at a measured pace. Almost all touring takes place on secondary or tertiary roadways. En route through olive groves, across mountain passes, or along the seacoast, we pause for unscheduled stops. Consecutive night stays increase time for walking. Greece is mountainous and the terrain is rocky. However, anyone who is physically fit and motivated can enjoy and complete any given walk or hike. Refer to individual trip descriptions to match your ability with the level of activity offered. Interact with a goatherd tending his flock. Devour vine-ripened strawberries purchased at a roadside stand. Photograph a sweep of crimson poppies. Walk an even, waterside trail to a pristine, whitewashed chapel. Climb a staircase to a centuries-old monastery perched on a sandstone pinnacle. Watch for a rare Egyptian vulture as you walk along Europe's cleanest, tree-lined river. Follow a narrow, stony cow path to a rocky point crowned by a 13th century fortress. Just had to say again how wonderful our trip with you was. We both loved The Peloponnese. Because of you, we left Greece with an appreciation for the Greek people, culture, and history. This type of appreciation does not come from reading books and driving to tourist spots. It comes from people like you who participate in Greek life. Thank you for sharing your Greece with us. The Peloponnese was an extraordinary experience, and I loved every single minute of it. Every hotel, every meal, every hike, and every drive was perfect. I appreciate your obvious concern for each of us; you ensured us a good and safe time. Your trip is very special, and you are a very special person. Thank you again for a dream. The whole trip was soulful. I shall never forget the place and time and friends. They are with me all the time, in detail. So many trips I go on seem to fade after a few months, but not The Peloponnese. I would love to travel with you again. My memory bank is filled with colorful images from Greece, including fields of crimson poppies. Thank you for creating a magical odyssey for all of us. When people ask me about The Peloponnese, I tell them the trip was better than perfect. We could never have become acquainted with so many Greek people, enjoyed so much outstanding food, and experienced so many spectacular outings without you. Best of all, you became a good companion and friend. I look forward to returning to Greece with you. I want to tell you again how much I enjoyed The Peloponnese. I loved the small group atmosphere and the flexible, personalized schedule. It didn't feel like a group tour. The food was terrific! The physical exertion was just right. I loved being in tiny villages and at sites off the beaten trackoften with no other tourists aroundwhere we met the local people, especially your friends. It felt like we were discovering ancient ruins ourselves! And the views! And the swimming! I look forward to going with you again. I feel very fortunate that I had a chance to visit central Greece with such a small group led by someone who speaks the languageand drives so expertly. You offer a unique opportunity to enjoy the spectacular landscapes, the villages, the shop owners who treated us to tsipouro and cheese. Thank you, Thordis, for making my return with you to Greece so special. I will hold onto the memories of Epiros & Thessaly forever. The Peloponnese was everything I expected times two! Thank you! I think about some aspect of my trips dailyThe Peloponnese and Epiros & Thessaly are so special. I can't thank you enough for sharing with us what you love so much. I have told people about my memorable trips, but the real meaning can never be understood by anyone who wasn't there. I have great respect for what you have done and will continue to do. As an indication of how much I enjoyed Epiros & Thessaly, for four nights after I returned, I dreamed I was still there. When the tour bus turned left, Thordis turned right. Traveling in the Cycladic Islands with our “Fearless Leader” was like traveling with a good friend, and she knew the way! The trip was priceless. The Battle of Thermopylae, Steven Pressfield, Doubleday, 1998. A national bestseller, this epic novel is a brilliant telling of a battle brilliantly waged. The narrator is the gravely wounded sole survivor of the Battle of Thermopylae, fought in 480 BC between the Persians and a small number of Spartans under the heroic leadership of King Leonidas. If you can tolerate or bypass the gory details, you will be rewarded by the author's masterful recreation of the Spartan way of life. The Collected Stories and other titles by H. Petrakis. A popular book club book that takes patience at the beginning, this novel seamlessly blends history of WW II in Greece with wit and romance. Rich and engaging. A Crowded Heart, Nicholas Papandreou, Picador USA, 1996. Written by the son of former Greek Prime Minister Andreas Papandreou, Papandreou creates a young boy whose family is uprooted from their home in the United States and moves to Greece where the father pursues his political ambitions. The family is swept up in an avalanche of revolution, military dictatorship, and exile. A beautiful rendering of the historical facts and myths surrounding the ancient city-state of Athens and the ancient kingdom of Minoan Crete, the books bring to life King Minos, Theseus, Ariadne, and the Minotaur. This classic of modern Greek literature is a popular tragedy. Its heroine confronts "woman's fate" with her own violent solution. A powerful, disturbing, and haunting story. These stories are about growing up both Greek and female in a culture characterized by patriarchal oppression. The author is an important feminist voice, and her stories about women whose only choices are submission, madness, or violence have meaning for cultures far removed from Greece. Tales from a Greek Island, Alexandros Papadiamantis, Johns Hopkins University Press, 1987. Twelve stories set in the author's native island of Skiathos capture the folkways of Greece. The book captivates the reader with its rich combination of realism and symbolism, sensuality, and mysticism. Zorba the Greek and other titles by Nikos Kazantzakis. The Colossus of Maroussi, Henry Miller, New Directions Paperbook, 1941. This book about the author's travels in Greece is incandescent with his feeling for a great people and their past. In 1982, the author moved to Elika, Greece. The villagers invited the "American Girl" to participate in every facet of village life, and they told their stories to her. Dancing Girl is a collection of 44 warm, spirited vignettes based on stories the villagers tell about themselves and those the author tells about the village. Demons and the Devil, Charles Stewart, Princeton University Press, 1991. Drawing on an unusual range of sources, from the author's fieldwork on the island of Naxos to Orthodox liturgical texts, this book pictures demons and other exotica as figures that enable individuals to navigate the traumas and ambiguities of life. Stewart examines the social forces that have alternatively led Greeks to understand these demons as links with the classical past or to reject them as signs of ignorance. Eleni, Nicholas Gage, Ballantine Books, 1983. This is the reconstructed story of the imprisonment, torture, and execution in cold blood of the author's mother for arranging the escape of her three children during the civil war in 1948. The First Fossil Hunters, Adrienne Mayor, Princeton University Press, 2000. The author theorizes that creatures once thought to be products of the imagination of the ancients actually are based in solid paleontological fact. For example, the picture of the griffin, a lion-size predator with a strong curved beak and wings, was developed nearly 3000 years ago by Scythian nomads prospecting for gold in the Gobi desert where exposed fossil remains continue to occur in abundance. When Greeks first made contact with the nomads from this area sometime in the 7th century B.C., they acquired stories about the gold-guarding griffin along with gold and other exotic goods. Mayor's account of how a ferocious, exotic creature had been brought to life from bones by the Scythian nomads is fascinating. Not to mention the Cyclops and other giants and monsters of whom she writes. The book reads like an adventure mystery. It's a masterpiece! From 1940-1950 women, who for centuries had been confined to the home, joined the Resistance and gained a sense of their human potential. Those confined to concentration camps were severely oppressed, yet by harnessing their energy and resources, they resisted tyranny. This book is a fascinating in-depth study of the fundamental values and institutions of a traditional community of Sarakatsani shepherds in the Greek mountains. Mani is a glorious fusion of scholarship, imagination, and history. The Mani was a remote and untouched region of the Greek Peloponnese where people lived in stone towers and practised the vendetta. The book is an inspired evocation of the past. My Story, Elisavet Moutzan-Martinegrou, University of Georgia Press, 1989. This first literary work in modern Greek by a woman sheds light on the restricted life of a genteel 19th century woman of the island of Zakynthos. She confides her feelings of lonliness and frustration and her longing for independence. Report to Greco, Nikos Kazantzakis, Simon and Schuster, 1965. Autobiography by the author of Zorba the Greek and other classic works. The author travels into the remote and trackless northern Pindos mountains to discover the landscape and to become a part of the life of the of a black-caped Vlach shepherd family. The book is a story of passion and friendship. Autographed copies of Dancing Girl can be ordered directly from astragreece inc. Please remember at all times that you are a guest in Greece. Carry with you required drugs and a legible copy of your prescriptions; do not pack in checked baggage. Medical assistance may be available at a clinic, staffed by a doctor, in larger villages; the closest hospital will be at least one hour away by car. Emergency medical evacuation insurance is mandatory. Up-to-date tetanus immunization is required; hepatitis A is recommended. One piece of soft-construction luggage absolutely not to exceed 22x14x9" or an internal frame/frameless backpack or duffel bag of comparable sizeplus a day packis allowed per participant. You will handle your own bags. Note: not all hotels have elevators. All hotels have private baths and clean rooms. Air conditioning/heat is not available at all hotels. Hot water may occasionally only be available morning and/or evening. You must have a valid passport; no visa required. Bottled water is widely available, but is not required. Anticipate paying a VAT (value added tax) of 20% or more on all goods purchased. Hiking boots are required. Rocks, gravel, thorns, scorpions, and snakes are considerations. Dress clothes will not be required. Bring 2 shorts, 2 slacks, 2 long-sleeved shirts (to avoid sunburn). Select clothing that can be layered for warm days and chilly nights. Include a wool sweater or warm fleece. Bring waterproof poncho: rain is possible in spring or fall; wind can occur any season. Pack a swimsuit for The Peloponnese, Crete, Cycladic Islands, Greek Village Sojourn, and Astra Writing in Greece; skirt (women) for Epiros & Thessaly and Cycladic Islands monasteries. Laundry service will not be available; pack hand-washable clothing, soap, and travel clothesline. Beach thongs will protect your feet from wet bathroom floors and possible oil on beach. Required: day pack, hat with brim, sun glasses, sun screen, flashlight, spoon, fork & knife, alarm clock, watch. Highly recommended: walking stick, gloves, cap, scarf, earplugs. Optional: 2 1-qt. water bottles, money belt, mosquito repellent, universal drain plug, pocket phrase book, "Sea Bands." Bring $50-$100 in euros (€) and several $5 bills for emergencies. ATM machines are available at the airport and in many towns and are the most convenient way to draw euros. Banks are open Mon-Thurs 8:00 to 2:00 & Fri 8:00 to 1:30 (closed weekends). Many stores in towns and cities accept credit cards. ***Please keep cash on hand at all times to pay for uncovered meals. Each itinerary offers ample unscheduled time for socializing or solitude; bring a journal, camera, sketch pad. The standard itineraries offer varying amounts of hiking &/or walking on rough roads and paths in hilly terrain. (Itineraries can be modified in advance to suit individual groups.) Please appraise your physical stamina and endurance honestly. No perfumes or other strong fragrances in the vehicle. No smoking in the vehicle, hotel rooms, or restaurants. Tour price, payable to astragreece inc., includes all hotels listed on the itinerary; transportation by van, car, or boat; specified meals; specified entrance fees; and trip notes. Tour price does not include cost of airfare to/from Athens, Crete, or elsewhere in Greece; cost of a valid passport; airport taxes; trip interruption/cancellation insurance (available from travel agent); emergency medical evacuation insurance (mandatory); medical insurance or expenses; transportation to/from airports; local bus and taxi fares; meals except those specified; entrance fees except those specified; personal expenses such as shopping and communications; additional expenses due to delay or changes in air or other services, sickness, weather, strike, war, or other causes beyond the control of astragreece inc. Uncovered meals (including gratuities) will usually cost approximately $250 to $350 per person. Price is based on double occupancy; a single-room supplement will increase the cost of the trip by $300 to $400. The price of this tour is based on estimates of actual costs; increases in exchange rates, tariffs, and surcharges may be passed on to participants. Reservations and payment: A deposit of $500 per person is due at the time of reservation. Full payment is due 45 days prior to commencement of the tour or immediately if registration occurs within 45 days of departure. Please make all checks payable to astragreece inc. Cancellations and refunds: Due to the unusually small size of the group, the deposit of $500 is not refundable. Changes in the itinerary are not expected, but astragreece inc. reserves the right to make necessary changes. astragreece inc. will not be able to refund the tour price if a person cancels within 45 days of commencement of the tour unless the tour is full and the place can be resold or astragreece inc. cancels the tour. No refund will be made for any person starting but not completing a tour. No refund will be made in the event that the tour cannot be completed due to events beyond the control of astragreece inc., e.g. natural disaster, war, etc. For these reasons, participants are encouraged to purchase trip interruption/ cancellation insurance. astragreece inc. reserves the right to cancel the trip prior to its commencement for any reason, in which case a full refund will be made. After paying this refund, astragreece inc. has no other obligations to tour participants of canceled trips. Restrictions: As a courtesy to other participants, no perfumes or other strong fragrances in the vehicle; no smoking in the vehicle, hotel rooms, or restaurants. Other agreements: In an honest effort to fulfill its obligation to provide a safe, quality experience for tour participants and to respect the host country, astragreece inc. reserves the right to refuse the application of anyone or expel any tour member whose conduct is deemed incompatible with these goals. Payment of the deposit or any or all of the tour price constitutes a tour participant's consent to all the terms, conditions, restrictions, and agreements specified in astragreece inc. literature.